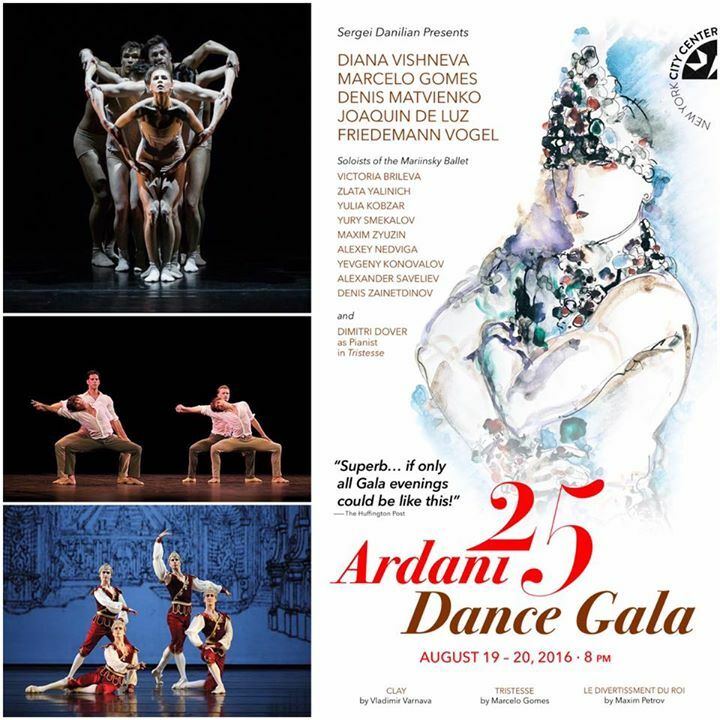 Sergei Danilian’s “Ardani 25 Dance Gala” at New York City Center, August 19 & 20, 2016…. is classic Danilian. The intrepid impresario, who has never side-stepped risk, will celebrate Ardani Artists’s quarter century of producing in the United States and abroad with a trio of U.S. premieres, two by young, unknown, but up–and–coming Russian choreographers, and one by American Ballet Theatre principal Marcelo Gomes. Challenging their performers’ stylistic and theatrical versatility, the three dramatically different ballets feature 16 principal dancers from the American Ballet Theatre, Mariinsky Ballet, New York City Ballet, and Stuttgart Ballet. 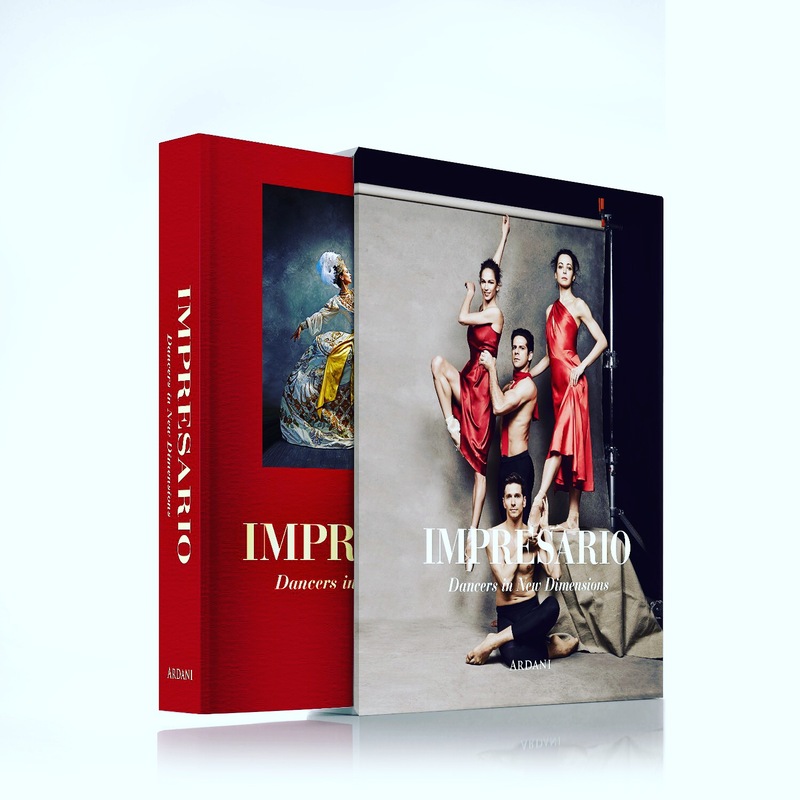 a 500–page coffee table book of 750 black and white and color photographs chronicling performances produced by Ardani Artists over the years and backstage portraits of the participating artists. will be released in conjunction with the New York City Center performances. Michael Khoury, Jason Kim, Alessio Migliardi & Nina Alovert. 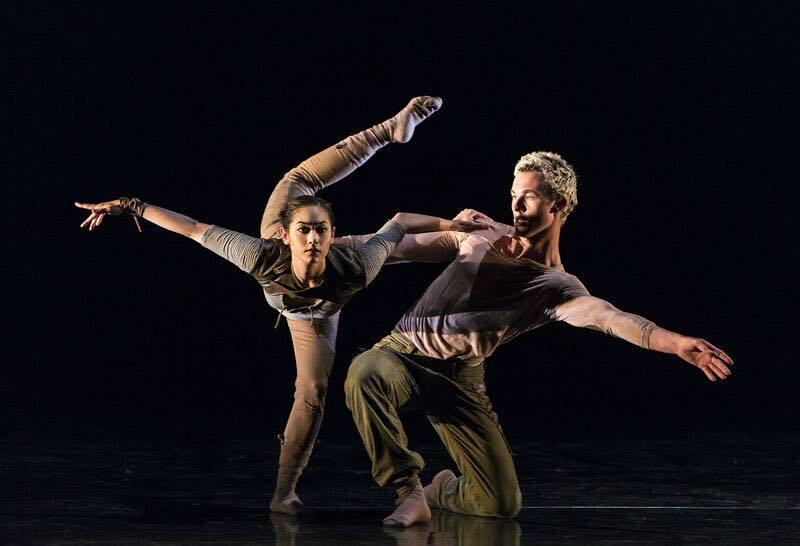 Santa Barbara Dance Theater’s Nikki Pfeiffer & Malcom McCarth in the duet from Joshua Beamish’s “Salt”…. 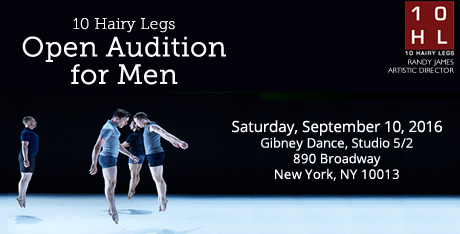 10 Hairy Legs seeks male dancers for 2016-2017 season of 28 weeks | Audition Date: September 10th, 2016…. 10 Hairy Legs seeks male dancers for our 2016-2017 season of 28 weeks. Dancers must have professional experience and excellent modern and ballet technique. We value those committed to working at a high technical level who thrive in a collaborative environment, embrace new ideas and concepts and are responsible group members. We are a repertory company so you must welcome and be open to a wide range of styles and dance idioms. Competitive performance and rehearsal pay. Seasons in NY and NJ; national and international touring. We encourage dancers of diverse backgrounds. Additional outreach and education opportunities. You must register in advance and bring your resume and head shot to the audition. You will be notified shortly after the audition if you invited to attend the Call Back. 10 Hairy Legs is an all-male repertory dance company performing existing and newly commissioned works. We have commissioned 12 works from choreographers Doug Varone, Doug Elkins, Tiffany Mills, Manuel Vignoulle, Julie Bour, Megan Williams and founder Randy James. We have served more than 50,000 patrons, students, artists and educators throughout the NY/NJ region, in NYC at New York Live Arts, The 92nd Street Y, Brooklyn Dance Festival, Modern Dance at Bryant Park, Dixon Place, Gibney Dance, Joe’s Pub, West End Theatre, Fire Island for the DRA Benefit Week End, Dance at Socrates, Koresh Come Together Festival; on tour in The Cayman Islands, New England; broadcast nationally and internationally on NJTV’s State of the Arts, The Meredith Vieira Show and Nick Cannon’s Red Nose Dancathon, and in residence at the Kaatsbaan International Dance Center. In August 2016 we tour to the Choreogus Dance Festival in Tulsa, OK, and in November 2016 we will be the only American dance company appearing at the Ikapa Dance Festival in Cape Town, SA. We provide a wide range of education programs for all ages focusing on the many facets of maleness as expressed through dance. The 4 M’s | Monte/ Molissa/ Margo/ Muller – LIVE! At New York Live Arts, June 14-18, 2016…. 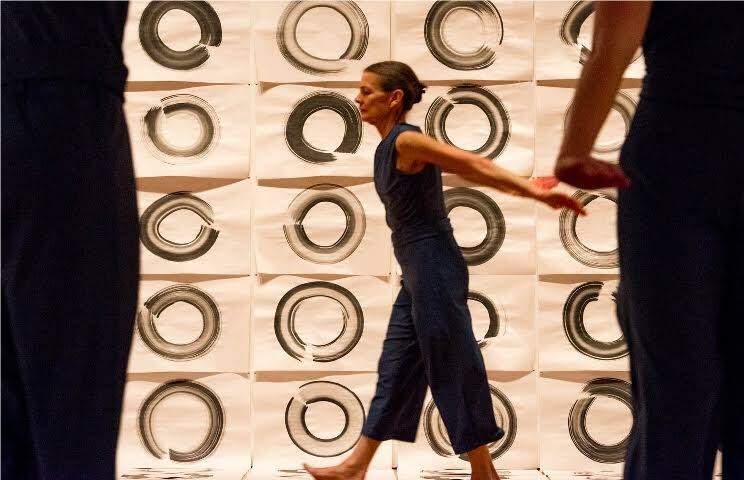 In 2013 Jennifer Muller contacted New York Live Arts and then Elisa Monte about creating a shared program for established choreographers. This year the program presented works by Elisa Monte, Jennifer Muller, Margo Sappington and Molissa Fenley in Monte/Molissa/Margo/Mueller – LIVE! At New York Live Arts, June 14-18, 2016. Dextra Dei began with four men slowly rolling onto the stage from upstage right. It is not evident that it is four men, not at the very beginning, lights and shadows allow glimpse of a moving mass of anatomy. The work is a powerful statement of the AID’s crisis so rampant in the 80’s and 90’s. The four men provide succor while giving strength and support to each other. When one jumps into the air he is caught and almost cradled/caressed before he stands and joins the others. Four women join the men showing both their compassion and support. You see four strong women express a combination of grief and outrage of the losses they have endured. But eventually the women withdraw and the four men are left alone on the stage, still struggling, but still supporting and caring for one another. Now I have to say that Molissa Fenley is Molissa Fenley for a reason and that reason is evident in her solo performance in the New York premier of Mali (Part 8 of Water Table). Ms. Fenley is able to capture and hold your attention in ways that many soloists lack. You witness her focus as she seamlessly blends her movement with both the music and lighting to create a visual statement of thought and expression. She moves her arms in pronounced angles while her body tilts forward or too the side all the while projecting a beautiful sense of serenity…It was a powerful performance and I am richer for having witnessed it….Thank you Ms. Fenley……..
Margo Sappington’s Entwined is set to the music of Eric Satie. The beginning I thought slow and did not truly hold my attention but as the piece progressed I found myself pulled in. I’ll be honest I am 50/50 on Ms. Sappington’s choreography. Of her works I have seen I find myself left with a feeling of either blasé or of being totally invested…for Entwined I was totally invested…. With Entwined, Ms. Sappington utilizes the classical vocabulary to create a stunning piece of contemporary ballet. The work had an inherent lyricism as well as musicality that many of Ms. Sappington’s pieces are known for…. Working Title is a fast paced work “about the difficulty of defining relationships in today’s world.” The dancers move in a controlled frenzy…relationships between the dancers are fleeting but still pronounced. But with both this year’s Working Title and last year’s Alchemy… let’s just say I am not sure what Ms. Muller has been up to the last few years….but whatever it is… please don’t stop. With both Working Title and Alchemy Ms. Muller has become the choreographer to watch. The two pieces I have seen over the last two years both exhibited her “out-of-the-box-thinking” which she applies with innovated movement and a willingness to experiment with the body in space. All I can say is I can’t wait to see what see comes up with next year…..
Billy Trevitt & Micheal Nunn in Russell Maliphant’s “Torsion”…. “WOMEN ON THE EDGE…Unsung Heroes of the Trojan War” | RIOULT Dance NY at the Joyce Theater, June 21-26, 2016…. guest artist Kathleen Turner on Jun 21, 23, & 25. 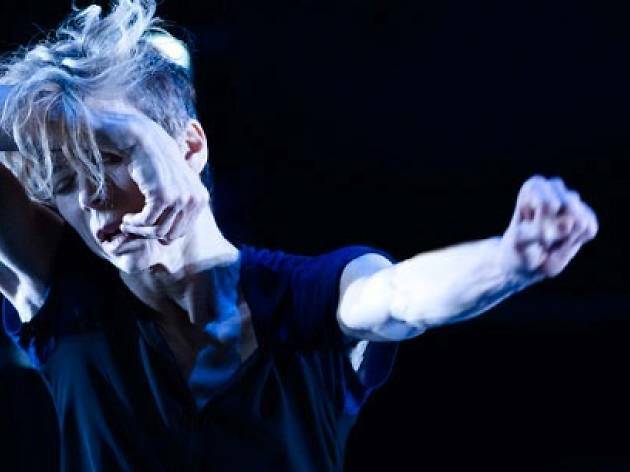 16 + a room, Solo Echo & Bill | Ballet BC at The Joyce, June 1-5, 2016…. 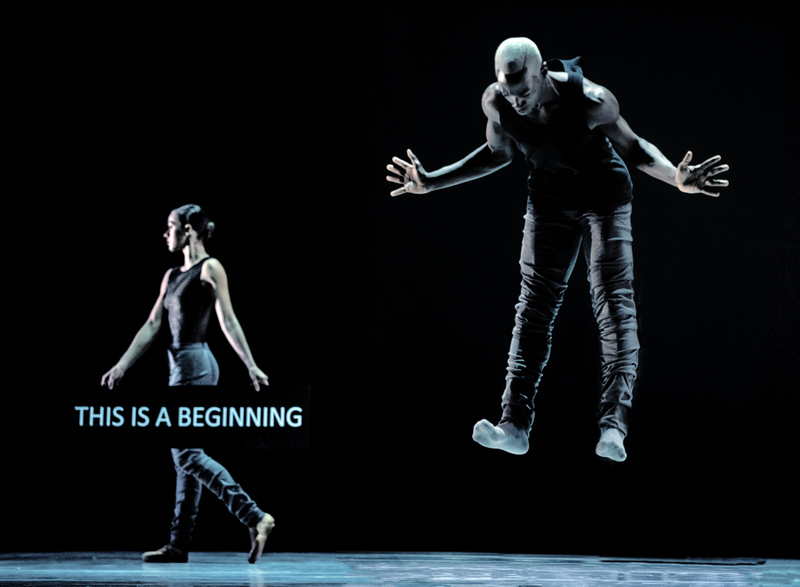 For the first time in 18 years the Canadian contemporary ballet company, Ballet BC (British Columbia) appeared at the Joyce Theater featuring the works of three female choreographers, June 1-5, 2016. There were moments in the 16 + a room where I was reminded of Mr. Forsythe’s masterpiece, In the Middle, Somewhat Elevated. For me, that is a great compliment, In the Middle, Somewhat Elevated is one of my top ten dance works I’ve ever seen…and I have seen a lot. The curtain opens and the dancers are standing still, momentarily another dancer walks on stage carrying a sign that read “THIS IS A BEGINNING” and so it is. In a burst of energy dancers start running off the stage. Within moments Rachel Price and Scott Fowler begin a powerful and emotional duet. The moment they touched you felt an energy, and unbridled passion as Mr. Fowler supports Ms. Price as she twist, turns, bends her body in quick constant movement…their duet was the star of the evening… Bravo to both Ms. Price and Mr. Fowler. Crystal Pite’s Solo Echo was, for me rather somber affair. I am use to seeing suich works by Crystal Pite as Ten Duets on a Theme of Rescue or Grace Engine…both of which pack a powerful punch. Solo Echo has a restraint to it, a mellower energy than what I have come to associate with Ms. Pite’s choreography. There is sense of caring and concern shared among the dancers, They stand in a line with each dancer’s arms encircling the dance in front of them…that dancer slips from those arms is if he is too difficult to contain, Solo Echo was a beautiful piece and exceptional danced but just not what I had expected…. Closing the evening was Bill choreographed by the Israeli duo of Sharon Eyal and Gal Behar. So far I have seen four of their works… Too Beaucoup, Sara, Killer Pig and now Bill…and after the bows and when the curtain has fallen…I am always left wondering one thing….Why! The manner in which this choreographic duo envisions the use of body in space, is for me, just strange….and not in good way. It’s as if the two insist on making the body seem as unattractive as possible. Legs bent, spine arched with arms reaching with the fingers spread like some type of spider. The head of the dancer sometimes even seems at odds with the rest of the body. To be honest the audience seemed to have greatly enjoyed Bill, But sadly, after watching the performance, Bill left me with the same unanswered question…Why! 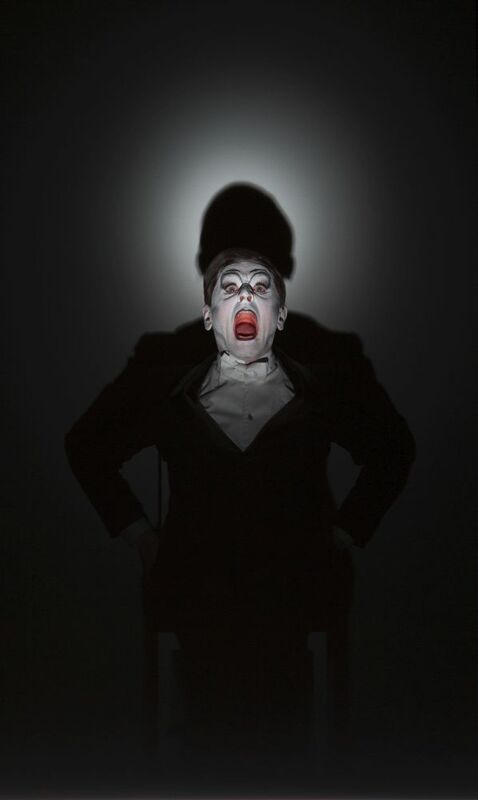 Robert Wilson & Mikhail Baryshinov Present “Letter to a Man” Based on the “Dairy of Vaslav Nijinsky”as Part of BAM’S 2016 Next Wave Festival…. Iconic director Robert Wilson and legendary performer Mikhail Baryshnikov are joining artistic forces to create a new performance work based on the famous diaries of Russian dancer and choreographer Vaslav Nijinsky who, in his prime, was recognized as the most celebrated male dancer in the Western world, performing with Sergei Diaghilev’s renowned Ballets Russes. The project is the second collaboration for Mr. Wilson and Mr. Baryshnikov, whose production of Daniil Kharms’ The Old Woman, featuring Mr. Baryshnikov and Willem Dafoe, has been touring nationally and internationally to critical acclaim. Of Nijinsky’s diaries, first published in 1936, American author Henry Miller wrote: “It is a communication so naked, so desperate, that it breaks the mold. We are face to face with reality, and it is almost unbearable…had he not gone to the asylum we would have had in Nijinsky a writer equal to the dancer. Letter to a Man is a theatrical work performed by Mikhail Baryshnikov, who enters the fragmented mind of the great dance artist as he descends into madness. As always in Wilson’s works movements, text, lights, set and music are equal parts of the same creation where, as he says, “all theatre is dance”. 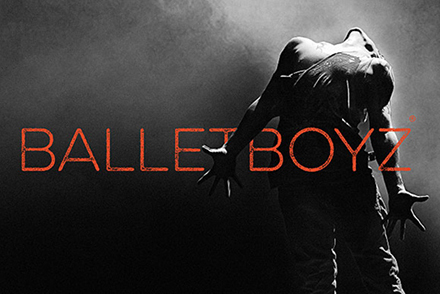 Ballet Boyz In Paul Roberts ‘Alpha’….